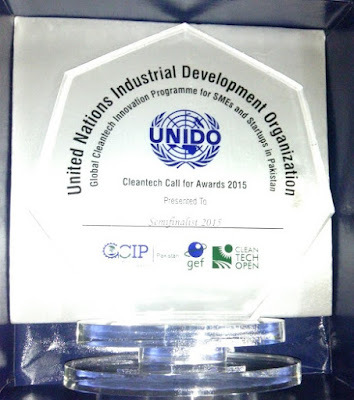 United Nations Industrial Development Organization (UNIDO) presents Highbrows Engineering & Technologies a shield for its initiatives towards innovation and R&D in Pakistan at the clean energy programme; Global Cleantech Innovation Program 2015. 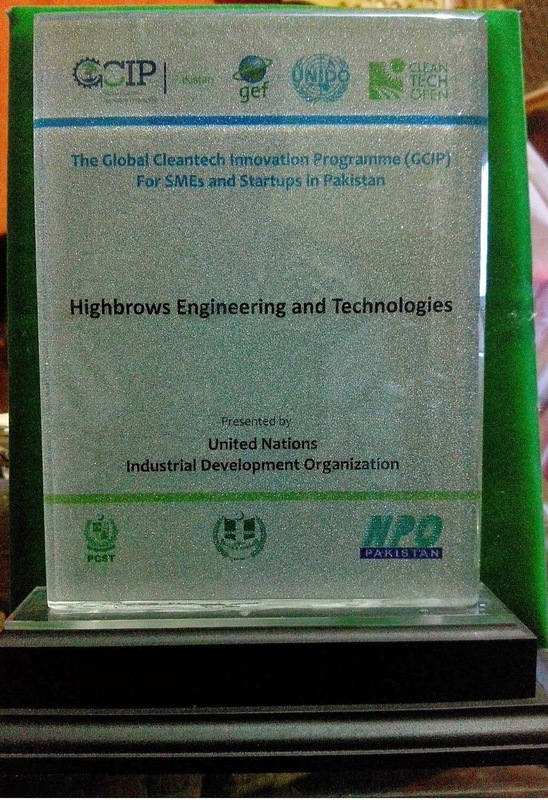 Highbrows Engineering and Technologies is featuring in Startup Expo 2015 at Pak-China friendship center, Islamabad. The feature page can be viewed at this link. With development of applications for different platforms including iPhone, Blackberry, Android etc, mobile app gadgets have taken billions in terms of revenue in online market via app stores (Davis 2010). With excessive processing power in the cell phones, they have become as powerful as desktop computers in many features (Davis 2010) and as far as enhancing educational and teaching facilities goes, they are as much help as fully development computer software (Davis 2010). Development of platform oriented mobile applications that are basically intended for sale as well as increasing the market value of the targeted mobile platforms can be of significant use in vocabulary teaching. Mobile applications for the purpose of teaching vocabulary cover Chinese, Japanese, and Spanish in addition to English (Davis 2010). A technique called ‘enhanced podcast’ is one of the many techniques that have found their way into the market for vocabulary based teaching applications; this one uses a series of digital flashcards to display vocabulary and help to learn (Davis 2010). In order to have a quantitative oversight for measuring the effect of mobile apps qualitatively, a review of the literature also reveals that the e-learning market’s growth has been 60% every year whereas the mobile applications specifically have increased by 65% (Subramanian 2013). That being said, schools are said to have been adapting various mobile applications and gadgets that help the students learn better. Qualitatively analysing this factor, for those who take up English language as a non native second language from their childhood might also be fairly categorized as non English students that will be affected by these applications as a part of this research. Taking India as an example where the non English speaking students are taught in English as a medium, english vocabulary is an essential part of learning. Students there benefit from usage of mobile applications to supplement their learning with the trend increasing at school administration level (Subramanian 2013). It can safely be assumed that learning of English language at schools in non english speaking countries (and hence for non english students) is having a positive effect by the use of mobile applications. This also implies that the students who quit schools in favour of home schooling also benefit from this technological development (Subramanian 2013). The same apps that were once used for listening to music and other leisure activities are now also dedicated to making available opportunities of mobile learning of vocabulary, spelling, alphabet, numbers etc; this kind of technology has also been found to have more appropriate effect on children (Krishna 2012). This has inspired various methodologies and teaching styles to find their way into the e-learning including letter songs (Computer Weekly News 2011). On the other hand, students who are taking competitive exams either for higher education admission purposes or otherwise are also among the ones that are supplemented by mobile application usage. GRE exams, for example, use mobile apps like GRE vocabulary flashcards and quick reference applications to aid the students to the full. Such applications are often available for download from app stores such as iTunes (Subramanian 2013). Additionally, A GMAT tool kit as available for free on Google Play for android and provides high quality content (Subramanian 2013). High and low priced mobile applications have found business in the field of e-learning as a developing sector and target market (Mint 2010). Vocabulary builder applications have found place on the mobile screens on par with e-books, flashcard games and speaking notepads (Mint 2010). With the ability of mobile applications of synchronizing to desktop or laptop computers (Mint 2010), the learning based on mobile application also has chances of finding an over all integration with the computerized and automated learning structure. Such integration can also be taken as a qualitative learning effect by the facts that social media and social networking has firmly entrenched learning and vocabulary of computer users even at a young age (Loertscher 2011). Specific and trademarked mobile applications such as ‘Pocket Vocabulary Coach’ are specifically designed to expose students to competitive vocabulary so as to prepare them for tests like ACT and SAT, college level words, and new unusual words for the sole purpose of improving communication skills (Finley 2012). SAT tests and the likes which are often given by non english students find such applications a pure quality oriented learning of english vocabulary (Finley 2012). ‘Pocket Vocabulary Coach’, in specific, focuses on sophisticated grammar learning and sophisticated vocabulary build up in addition to the above mentioned targeted learning (Finley 2012). Davis, Carolyn (February 7, 2010). Apple opened bonanza for app developers. Tribune-Review/Pittsburgh Tribune-Review. Periodical. Subramanian, Aishhwariya (March 5, 2013). City schools take the online route for imparting education: According to latest estimates, e-learning market is growing 60% per year, says founder of an internet-based learning portal. DNA : Daily News & Analysis. Periodical. Krishna, R (February 19, 2012). Why kids prefer the real deal. DNA. Sunday. Periodical. (April 14, 2011). ABCmouse.com Early Learning Academy Releases First Original Album, The Letter Songs A to Z Now Available on iTunes. Computer Weekly News. Periodical. (August 24, 2010). Different tools, different abilities. Mint. Periodical. Loertscher, David (April 2011). 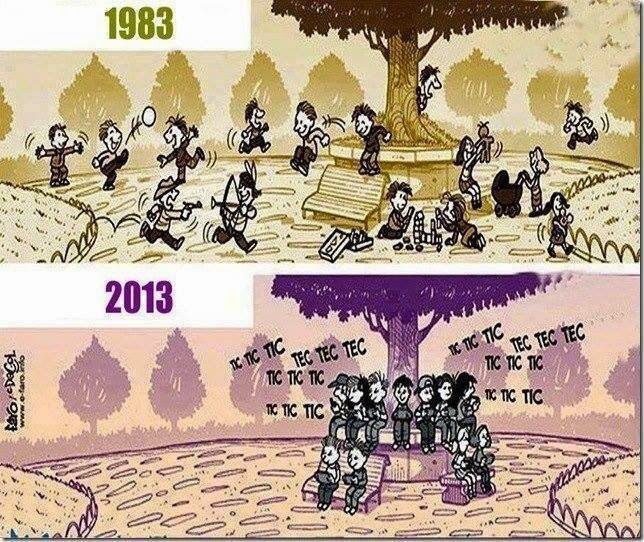 The State and Futures of Educational Technologies. Teacher Librarian, Vol. 38, No. 4. Periodical. Finley, Sally (November/December 2012). Pocket Literacy Coach. Internet@Schools, Vol. 19, No. 5. Periodical. So you are interested in knowing how our co-founders crossed paths and how Highbrows Engineering and Technologies was founded...? It is necessary to understand how the research on the topics of project management and in specific, enterprise resource planning are being is suggesting its evolution. Using a database as basis for information, enterprise resource planning systems can make use of different computer networks and resources to manage the communication between critical parts of a business (Khosrow–Puor 2006). Additionally resources like “Advanced planning and scheduling” supplement the enterprise resource planning as sets of technologies that ensure hardware compatibility of planned communication - the business processes and technologies are meant to make the company self sufficient (Naden 2000). Another possibility as per literature recommendation is the merging of project management theories through technologies. What if exotic project management theories from total quality management and enterprise resource planning were to be merged to ensure effective communication and quality assurance at the same time? Having critical effect on the business, these two practices as organizational planning efforts in combination with software applications based on cloud computing and total assurance of cooperation of everyone involved in the system based on quality control can help the business gain cutting edge competitive advantage in the market (Laframboise & Reyes 2005). Research alludes wide range of sources that talk about the total quality management triggers to gain competitive advantage in a situation where they have been implemented together with communication and collaboration solutions like enterprise resource planning (Laframboise & Reyes 2005). The collaboration over the internet, even with the remote parts of the business, has been made easy due to cloud computing where the data is being stored and accessed from a central computer and allows multiple users to work together in the same environment with online collaboration tools. This can significantly benefit business communication (Clive 2008). Further hiring the right kind of staff for each project makes the project management less complex and more delegated; instead of wasting time over choosing the right qualifications, the focus on talent can help the projects be adequately equipped with excellent staff (Kathleen 2009). Enabling the organizations to use tools based on project management theories, the organizations can cope with the complexities of modern day market and competitive environment (Thamhain 2004). The advances in information systems and information technology presents project management with complete and optimal execution of projects in such a way (Thamhain 2004). The knowledge transfer is significantly affected by the incorporation of information technology in project management (Thamhain 2004); fast transfer of knowledge generally speeds up the process and helps achieve the desired outcomes in a shorter period of time. The modern project management culture based on project teams (Thamhain 2004) is further supported by collaboration systems that enable the technical staff to communicate with adequate tools over long distances. This makes it easier for physically manage projects at the desired sites as well as collaborate for technical assistance from the head quarters (Clive 2008; Computer News Middle East 2011). Successful implementation of enterprise resource planning systems does not go without its perks, a multitude of companies in United States have started to implement the strategy and as a result reduced their business costs by automating information sharing enterprise wide (Krumwiede & Jordan 2000). Companies basing their projects on pricing strategies like those of low price and high volume, get to benefit the most from this implementation (Krumwiede & Jordan 2000); in short all companies managing mass production projects can get the most of this (Krumwiede & Jordan 2000). Research alludes to ease of processes like shipping, managing suppliers and paying for logistics to be enhanced by this strategy (Krumwiede & Jordan 2000). By successfully managing project oriented production; mass production or prototyping alike, information technology gives decreased project timings and costs with increased profits for the company. By developing accurate softwares that can manage the pre requisites as well as the in-processes resources, designing products can become a very simple task (Stellman & Greene 2005). The fast knowledge creation and sharing is a good resource that can be merged with project management theories like six sigma (Nold 2011). Research attributes it as a “Tell fast, fail fast, adjust fast” process, as quoted by Tom Peters, to improve the quality with speed (Nold 2011). This concept strains on the six sigma theory that the high speed change and dynamics of business evolution often have a slowing effect on businesses and adjusting to them in real time is critical for a business to succeed (Nold 2011). This drawback of dynamic business environments (ironically created by the modern technology’s speedy production) can be countered by employing project management strategies with technology supporting the fast generation, sharing and collaboration with respect to knowledge, technical know how and staff training (Clive 2008). Significant literature reports; academic and industrial, make it clear that a blend of project management strategies with latest technologies of information technology (possibly ones that merge with hardware like in the case of CNC machining) makes the project management succeed per se. The ‘inherent uncertainty’, as the research names it, becomes the main task that has to be correctly handled for the survival of the business in modern world dynamic economy and puts all its burden on the project leaders and managers (Nold 2011). The literature study in this regard supports a research based on project management & its communication with respect to evolving technology. The purpose of detailing the project management tasks is to understand how project management is affecting a business so as to develop the basis for technology’s effect on these processes. To gain competitive advantage in the long run, companies need to be successful in project management (Bolles & Hubbard 2007). To gain the best out of project management, it needs to be employed at all levels of hierarchy in a business. Currently, project management is being used as an executive level function in a few organizations only but it is expected to be one of the standard practices in the future businesses (Bolles & Hubbard 2007). Project management is not solely meant for manufacturing purposes and has its applications at much versatile levels. Objectives like product development and services are also a major part of project management and now the information technology itself has also become a part of project management other than contributing to it as a tool (Bolles & Hubbard 2007). Businesses need to apply strategic practices and thorough planning so as to succeed in the enterprise competition. Project management involves detailed business management programs that cater for all the needs of the stakeholders and capturing product or service value by the use of project activities (Bolles & Hubbard 2007). Where project management was once just about optimizing project timings and costs, it is now much more than that. It contributes to competitive advantage of the enterprise as well as gives it the opportunities for managing all other business task and might also involve business process re-engineering (Bolles & Hubbard 2007). Project management is often deployed as an enterprise wide project. This means that the managing of ‘projects’ might be actually the managing of major components of business itself. Project management on the other hand is not a lone wolf. There are many other business processes that are going on in an enterprise. For example, operations management is one of the key process that controls a running business. Where the project management details how each categorized project is being (or is to be) managed, operations management focuses on the actual day to day tasks that are being carried out to fulfil the business or project requirements. These two often need to run smoothly in synchronization. To achieve this, project management has to be streamlined with operations management. Furthermore, processes from both sides; project management and operations management, need to be integrated to facilitate this (Bolles & Hubbard 2007). Project management as a whole might be divided into sub concepts of governing the project to see if and how well the enterprise is involved in project management and how difficult related implementations are. The use of project management as a business process and furthermore as a competitive tool for the business as explained before is also a part of this understanding (Bolles & Hubbard 2007). The above mentioned integration of operations management and project management on the other hand are actually a standardization concept. This also involves the business or project level plans and policies as well as finding out what kind of procedures are required to support a level of project management that can be implemented enterprise wide (Bolles & Hubbard 2007). The next core concept of project management is the capability of the implementation. Can the project managers cater for the knowledge and skills that are required for effective completion of tasks and the project’s management and if the organization itself has the capabilities to either support technically or fund the project establish facts that decide of the project management is going to be successful. This also involves introducing career oriented campaigns that help to maintain a sturdy approach to education and training of involved staff, managers and practice of technical staff as well as acquisition of capabilities on par with organization’s acquisition of a portfolio (Bolles & Hubbard 2007). Once the project manager is aware of the capabilities of the organization, the team and the equipment available, execution of the project takes over. Each project management process has to be translated into operations management procedure with clearly stated business objectives and all programs and portfolios need to be overseen. With operational planning taking care of day to day activities and the organization’s vision and policy dictating the long term aim, tactical and strategic planning take care of what more the project has to offer (Bolles & Hubbard 2007). A strategic leader is better defined as an entrepreneur than as a steward (Hargrove 2001); the aim is not to just bring equilibrium to the organization but also take risks. 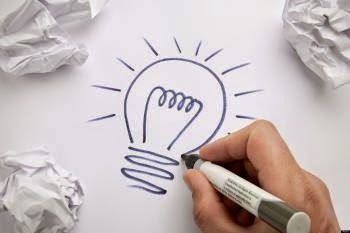 The modern advancements like internet and a connected economy do not threaten adequately equipped strategic leaders, rather they take it as an opportunity and take a plunge into the open door that invites the company to success (Hargrove 2001). In a connected economy of uncertainty and interdependence, managing the organization strategically is enables rapid deployment of corporate techniques to balance the worker motivation and business environment to ensure productivity (Hargrove 2001; Georgantzas & Acar 1995). The examples of those who have successfully managed organizations of different prospect; business and political alike, have known to have purposeful ideological concepts and management approaches that are not just theoretical but also support realistic and practical implications (Storey 2004). This puts the strategic leadership with regards to project management to be an essential task as well. After the execution per se, maturity of the project has to be taken into consideration. This includes evaluation and analysis of the project on the enterprise wide basis and the control of the enterprise’s operational costs with regards to the project in question (Bolles & Hubbard 2007). Knowing how project management proceeds conceptually in an enterprise, the project management’s improvement with technology can be understood in analytical terms. Whether or not, and to what extent, technology has favoured project management solutions in these conceptual terms and for improving strategic leadership advantages in projects or business as a whole can be compared against the core concepts of project management as explained above. Looking at what traditional approach has been used to manage projects is the next step. The basic stepwise or phase wise project management techniques that are used in project management even without the use of technology are mostly business techniques or tools. For example phasing the projects in such a way that it is systematically phased in by initiation of the project follow by a detailed planning and design time and resource allocation, execution and construction of the actual project, controlling the system and then completing the project. This somehow turns out to be inline with the basic core project management aspects explained. Infact, this is simply to follow those procedures in the same order in a traditional approach without the use of any extra technological tools to complete the project as defined, satisfying all the core processes on the way. Industries use schematic design phases to depict project management into the way it is being phased. This approach, known as the ‘waterfall model’ in software development (Royce 1970), makes the linear sequence help the project manager align the project phases into a sequence. Comparing this traditional approach although possibly software aided (Royce 1970), with the more technologically supported methods gives a critical overview of technology’s contribution. Prince2 is a method that was released in 1996 as a project management methodology and tool for genericized purposes. Prince2’s combination of technologies provided a framework which provided full control over how to coordinate, supervise and manage the project (Science Letter 2009). Prince2 proved to be a successful tool that was later relaunched in 2009 with accredited trainings in order for related personnel (Science Letter 2009). On par with the traditional approaches to project management, Prince2 was used in 150 countries and 20,000 organizations with daily growth in its utilization (Science Letter 2009). Prince2 as a tool is also considered to be a lingua franca for the organizations and suppliers who might be having different internal procedures but are using Prince2 for their project management (Science Letter 2009). This helps them to deliver projects on time as well as accurately manage the quality, timing, risks, advantages, coverage and scope and costs of the projects (Science Letter 2009). Prince2 like other technological advances had its share of criticism which was duly addressed and remedies incorporated in the 2009 launch so as to satisfy the project managers. Such continuous improvement in project management technology which went so far as being lingua franca between organizations also became the best practice (Science Letter 2009). Additionally, 170 organizations are dedicated to delivering training required for Prince2 with examinations for this methodology being taken in 150 countries around the world (Science Letter 2009). As such this is a reknown technological improvement with significantly visible impacts on project management and communication. When a project management tool which is built and designed to improve project management per se, becomes the bridge language just because of standardization of the system, it might be a hint of the scale at which the technological advancements and standardizations would help inter-organizational project management communication even when the internal policies significantly differ, not to mention the improvement in internal project management communications and the usage of the tools which are actually made to improve project management communications (Science Letter 2009). Where comparing project management concepts with technology development explains how the technology is blending into the project management, looking back again to see how project management changed with technology instead of how technology emphasized this change gives another perspective to view the scenario of technology contribution; that is, a reverse perspective. Project management was already trending with advancing modern age where more and more complex tasks were to be done under yet more complex circumstances. Understanding project environment and other project variables like product life cycles and systems approach are necessary to get a grasp of technology changes chronology (Schwalbe 2008). In 1950s, when holistic approach was needed to analyse and describe the problems that were complex in nature, systems approach was developed (Schwalbe 2008). It requires stepwise definition of the system and the problem, categorizing the problem into important and essential components, evaluation and identification of the issues, requirements, opportunities and drawbacks or limitations (Schwalbe 2008). With a complete analysis of this, systems approach aims to explore alternative solutions to provide the best for project management and resolve the issues (Schwalbe 2008). The target is to optimize, analyze and improve the situation of the system with the intention of changing the system itself for the improvement of the system (Schwalbe 2008). It might safely be assumed that the contribution of technology or information technology to effective project management is not a one way processes. It would be better identified as a two way recurring process where information technology is re-gaining from the improvement in project management. On contrary to other industrial projects, information technology projects can be versatile and diverse. They might involve a few hardware or software installations or they may involve a major analysis of a multitude of people, processes and organizations to design custom built software solutions or bespoke solutions (Schwalbe 2008). Improved project management technologies in this regard help the sophisticated information technology implementation and often even make it possible at all. It might safely be said that project management now overlaps with software based business process automation and solution provision with a unique context and a whole different set of issues and studies to be carried industrially and academically (Schwalbe 2008). Looking further into research for how project management’s technological effects influence business, it is revealed that reinventing and improving project management is essentially a research and development process (Markham 2007). The reason for this is not the reinvention of the project management processes, it might not even cover the topics of actually managing projects, rather what reinventing project management results in is more critical than this; it relates project management to strategy (Markham 2007). Project management being a linear world of processes needs to be well integrated with comparatively complex world of strategic planning. As described, strategic planning is the way to make sure that realistic approaches are involved in managing the organization or the projects. Strategic leaders who are also to be taken as entrepreneurs (Hargrove 2001), when crossed over the redline to be the project managers would be able to reinvent strategies that would then be integrated at project levels keeping the projects on time with market requirements, keeping budgets in line and in control as well as managing projects retrospectively (Markham 2007). Improvement in project management technology is, hence, taken as the factor which dictates the fate of the project management. Based on what kind of technological improvements project management has gone through in an area, strategic planning’s incorporation into project management reduces uncertainty. This might more precisely be known as ‘Managing Project Management’ (Markham 2007). After seeing how technology and project management co relate in a cross knitted manner, it would be best to see how project management is best contributed to by the information age’s most favoured benefit - collaboration and central computing. Project management tools, as a result of information age technology, enable project managers to provide their staff with training, practice, education, online programs, workshops and online courses remotely. These tools enable sharing and collaboration of information no matter how far team members are from each other (Milman 2011). By using project management collaboration tools, effective communication is directly made possible where the mode of communication increase and provide a diverse set of choices (Milman 2011). Each choice suited for the required task, mode of communication is not limited to voice communication and file copying anymore. The computerized collaboration tools that allow voice and text chat in addition to file sharing go a step ahead to provide additional modes of communications to facilitate project management. The top benefit of these additional features are synchronous tools that enable simultaneous editing of the same content by the team members allowing them to edit together in collaboration or review later at will. Creating draft project presentations and discussing and analysing the efforts are seen to be effective tools to improve project handling by team members (Milman 2011). As such, information technology’s direct contribution to improving project management communication has been very significant (Milman 2011). Furthermore, project management tools help individuals project management tools also act as trackers that allocate suggested time to the tasks and facilitate project management communication by keeping the tasks on time and optimizing the communication gap (Milman 2011). Information systems across organizations have been the most important factor in intra organizational communications. To improve this, enterprise resource planning systems and information management systems have been developed over the past decade (Laonamtha & Ussahawanitchakit 2012). These systems integrate business features and activities across different platforms. They might be used to integrate finance and accounts related information flow to coordinate human resources against them or managing technical aspects of manufacturing in light of this information flow (Laonamtha & Ussahawanitchakit 2012). Bringing the key aspects of the business to a common platform where the project manager or the relevant managers can manage all these aspects simultaneously and with insights about their counterparts, integration and linking of information in this manner provides valuable information to achieve goals at both inter and intra organizational level (Laonamtha & Ussahawanitchakit 2012). To meet high flexibility and customer demands or to improve and enhance operational performance, communication across the production floor might be an important factor; communication across multiple departments, however, might be the factor that would just get the company the right kind of competitive advantage in the market (Laonamtha & Ussahawanitchakit 2012). Improved communications in an organization also improve other aspects like making plans, controlling the processes, monitoring the business, and real-time reporting of financial factors (Laonamtha & Ussahawanitchakit 2012). The gain of competitive advantage in the market by such factors is based on improving project effectiveness and efficiency by improving operations and strategies. Enterprise resource planning system, in this regard, is considered by academic literature to be an organization’s fundamental for survival in the market and growth as a business (Laonamtha & Ussahawanitchakit 2012). Project management is often to manage the resources and deploying them in the right manner. Enterprise resource planning defines the organization’s business processes by giving them the ability to deploy, manage, select, combine and integrate resources with input from all departments (Laonamtha & Ussahawanitchakit 2012).Strategic initiatives are basis of all business planning and go hand in hand with all kinds of modern project management. Integration being one of the modern enablers of communication through modern project management technology also suggests that the most critical processes be integrated in such a manner that the communication gap is removed and the efficiency of the underlying processes is increased (Laframboise & Reyes 2005). Total quality management’s aim in the business is normally to make the best of the quality resources in such a way that the products or services exceeds customers’ expectations. Process management and strategic planning also happen to be total quality management’s main aspects. Knowing that they go together with project management, it would be wise to integrate all these processes for a better cross platform management (Laframboise & Reyes 2005). As suggested and explained in the beginning of the literature review, such a merger would provide the best of two worlds. Total quality management and enterprise resource planning, both, have wide scopes and cover many major areas of a company’s processes (Laframboise & Reyes 2005). Combining systematic research and technology driven communication is a certain way to get the best quality with minimum expenditure. Where the main aim was to improve the quality, this integration will now enable to improve quality in a more efficient way where total quality management is actually also a way to cut budgets. Strategic resources can better be utilized with resource based review and hence gaining key competitive advantage in the market as a business (Laframboise & Reyes 2005). Such implementation of technology contributes to procurement, manufacturing and distribution related activities, all, being networked in a way where they are collectively responsive (Laframboise & Reyes 2005). As a positive side effect of this implementation and contribution of technology to project management communication, supply chain processes improve and strategic decision making and manufacturing ability of the firm is established in the market (Laframboise & Reyes 2005). Information technology’s integration into a single solution makes processes like materials requirements planning, total quality management and enterprise resource planning a single central management unit with enhanced functionality and better communication (Laframboise & Reyes 2005). Anderson, M. C., Banker, R. D., & Ravindran, S. (2003). The new productivity paradox. Communications of the ACM, 46(3), 91-94. Barker, T., & Frolick, M. N. (2003). ERP implementation failure: A case study. Information Systems Management, 20(4), 43-49. Brynjolfsson, E., & Hitt, L.M. (1998). Beyond the productivity paradox. Communications of the ACM, 41(8), 49–55. Computer News Middle East (September 21, 2011). Planning for growth. Cleland, D.I. (1994). Project Management-Strategic Design and Implementation, Second Edition. McGraw-Hill, Inc.
Clive Akass (November 27, 2008). Back to the future. Personal Computer World. Dainty, A.R.J., Cheng, M.-I., & Moore, D.R. (2005). A Comparison of the Behavioural Competencies of Client-Focused and Production-Focused Project Managers in the Construction Sector. Project Management Journal, 36(1), 39–48. Bolles, Dennis L.; Hubbard, Darrel G. (2007). The Power of Enterprise-Wide Project Management. AMACOM. Fisher, E. (2011). What practitioners consider to be the skills and behaviours of an effective people project manager. International Journal of Project Management, 29, 994–1002. Gareis, R. (Ed.) (1990). The Handbook of Management by Projects. Manz. Georgantzas, Nicholas C.; Acar, William (1995). 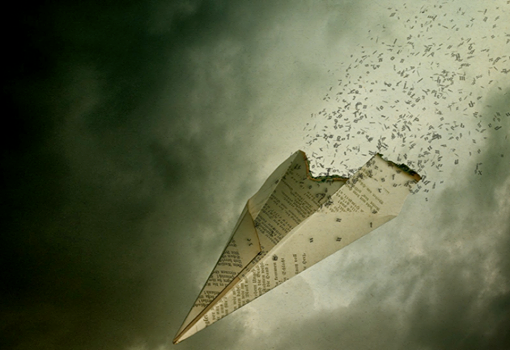 Scenario-Driven Planning: Learning to Manage Strategic Uncertainty. Quorum Books. Book. Print. Hargrove, Robert (2001). E-Leader: Reinventing Leadership in a Connected Economy. Perseus Pub. Book. Print. Kathleen Koster (September 15, 2009). Fish or cut bait; Employers can find either feast or famine when fishing for talent on social media sites. Employee Benefit News. Khosrow–Puor, Mehdi. (2006). Emerging Trends and Challenges in Information Technology Management. Idea Group, Inc. p. 865. King,W. R. (2002). IT capabilities, business processes, and impact on the bottom line. Information Systems Management, 19(2), 85–87. Krumwiede, Kip R.; Jordan, Win G. (October 2000). Reaping the Promise of Enterprise Resource Systems. Strategic Finance, Vol. 82, No. 4. Laframboise, Kevin; Reyes, Felipe (Summer 2005). Gaining Competitive Advantage from Integrating Enterprise Resource Planning and Total Quality Management. Journal of Supply Chain Management, Vol. 41, No. 3. Laonamtha, Uthen; Ussahawanitchakit, Phapruke (April 2012). Enterprise Resource Planning System Capability and Decision Making Success: Evidence from Thai Manufacturing Businesses in Thailand. Journal of Academy of Business and Economics, Vol. 12, No. 4. Marchand, D. A., Kettinger,W. J., & Rollins, J. D. (2000). Information orientation: People, technology and the bottom line. Sloan Management Review, 41(4), 69–80. Markham, Stephen K. (November/December 2007). Reinventing Project Management: The Diamond Approach to Successful Growth and Innovation. Research-Technology Management, Vol. 50, No. 6. Milman, Natalie B. (July 1, 2011). Communication, Collaboration, and Project Management Tools for Producing and Managing Group Projects at a Distance. Distance Learning, Vol. 8, No. 4. Moore, D.R., Cheng, M.-I., & Dainty, A.R.J. (2003). What makes a Superior Management Performer: The Identification of Key Behaviours in Superior Construction Managers. Construction Information Quarterly, 5(2), 6–9. Morris, P.W.G. (1994). The Management of Projects, 1st Edition). Thomas Telford, London. Naden, Jeff (2000). "Have a successful. (implementing project management technologies)." IIE Solutions. Institute of Industrial Engineers, Inc. (IIE). Nold, Herbert (June 2011). Merging Knowledge Creation Theory with the Six-Sigma Model for Improving Organizations: The Continuous Loop Model. International Journal of Management, Vol. 28, No. 2. Rosenau, M.D. (1998). Successful Project Management, Third Edition. John Wiley & Sons, Inc.Turner, J.R. (1993). The Handbook of Project-Based Management. McGraw-Hill Publishing Company. Royce, Winston W. (1970). Managing the Development of Large Software Systems in: Technical Papers of Western Electronic Show and Convention (WesCon) August 25–28, 1970, Los Angeles, USA. Schwalbe, Kathy (June 6, 2008). Information technology project management. Cengage Learning. Science Letter (June 30, 2009). PRINCE2 2009 Launched. Stellman, Andrew; Greene, Jennifer (2005). Applied Software Project Management. O'Reilly Media. ISBN 978-0-596-00948-9. Storey, John (2004). Leadership in Organizations: Current Issues and Key Trends. Routledge. Book. Print. Thamhain, H. (2004). Leading technology- based project teams. Engineering Management Journal, 16(2), 36–42.Thamhain, Hans J (June 1, 2004). PROJECT MANAGEMENT, INFORMATION TECHNOLOGY, AND INFORMATION SYSTEMS. Engineering Management Journal. Research is one of the most essential sources of human growth into an advanced civilization. Time and again, man has used research as his tool to organize and optimize his resources, both as individual and as civilization. The research per se can be on any topic at all, regardless of the results being positive or negative; research is of as much benefits with negative results, telling the researcher either not to choose a specific route or to categorically prevent catastrophes. Research, being an iterative process, continues over time and has to be repeated while it corrects the previous data available and as well as providing new theories. The acceptance of this fact alone is enough to say that research is not only “not-perfect”, but also not supposed to be perfect in order for more research to occur. The reasons for a research not being perfect can vary from simple facts and figures themselves, their accuracy, the proportions of them being used in the samples, present theories and relative science to mere possible existence of the facts and scientific processes physically. It is the most often made unavoidable error in population research that the sample size and group being used from the population can not be perfect. The data obtained from a sample size can not accurately represent the whole population even if taken in the same proportion and group format. The reason for this can simply be human diversity, if it is about a human population, or mathematical variability in probability. Perfection in this respect can only be assumed if the research takes into account the whole population of things/species into account and yet other types of imperfections will be there. Human error is the next most repetitive one. A scientific research done by different individuals often yields different results and this kind of error is curbed by comparing results and doing further research, hence going in to the same iterative cycle of research. This might also tangentially involve deliberate bias from the researcher. Such imperfection, though not known as “human error”, is attributed to humans for not having a neutral point of view as each individual and then each society see things from their own perspective be it morality, politics, sociology or simple interpretation as a society. Such diversity in human societies and individuals results in the research being non homogeneous but on the contrary it provides break-through in ways that a homogeneous research could never have provided. Systematic errors from the equipment and tool issues are often there as well which can be easily removed in case of simple tools having zero errors but are much more difficult to track and eliminate in complex algorithms involving space and computational technology. Such errors have further amounted to imperfections in research mostly in the modern and information age. From the start of time, human use of tools is significantly notice able and the research work has been continued and repeated by civilizations often while others diverge into their own unique ways. Imperfection is the beauty of the universe. With nothing created perfect and imperfections making everything stronger, starting from the micro level of the materials physics to the macro study of the human diversity, research’s very own imperfection makes it a perfect process to develop in to uniquely diverse directions where mistakes develop into new foundations of a different branch of science. Evidence from these facts not only support the fact that research can not be perfect but also provide insight on the perspective that imperfect research is the bases of leaping ahead. Fink, Anne. "The Role of the Researcher in the Qualitative Research Process. A Potential Barrier to Archiving Qualitative Data." Forum: Qualitative Social Research. 1.3 ( 2000): n. page. Web. 16 May. 2012. Mehra, Beloo. Bias in qualitative research: Voices from an online classroom. The Qualitative Report, 7(1). 2002. Web. 22 August 2010. United Nations Industrial Development Organization (UNIDO) presents Highbrows Engineering & Technologies a shield for its initiatives towards innovation and R&D in Pakistan at the clean energy programme; Global Cleantech Innovation Program 2014.